Automatic watch equipped with Calibre Royal manufacture movement, symbolising a renaissance in manufacture-based French Haute Horlogerie. In the heart of the French Jura watchmaking country, Pequignet Manufacture is an independent, family-run luxury watch company. Pequignet Manufacture was able to rise to the challenge of creating its own manufacture movement which, in a world first, integrates all the haute horlogerie complications on a single main plate. The Calibre Royal was created: a calibre praised as exceptional in terms of performance, beauty and accuracy. It is not commonly known, but watchmaking was a French discipline until the Edict of Nantes was revoked in 1685, forcing two thousand Huguenots, the watchmakers to the king, to leave France… Throughout the 19th and 20th centuries, watchmaking was carried out in the Jura region: an area which is part Swiss, part French… The phenomenal rise of quartz between 1970 and 1975 swept away the remnants of French mechanical watchmaking. However, despite all this, France has kept its connection to watchmaking alive : 17,000 French experts on the border form the largest contingent of “complete” watchmakers, the famed mechanical watch specialists… France has the greatest number of watchmaking schools and offers the most highly respected training in the world. 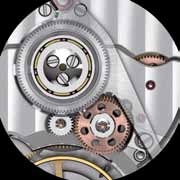 Paradoxically, since LIP disappeared in 1975, there have not been any French manufactures making mechanical movements. France has kept its connection to watchmaking alive, but without an incarnation, without a manufacture. The Calibre Royal is truly the one and only Manufacture-produced Haute HorlogerieFrench calibre for more than 40 years. 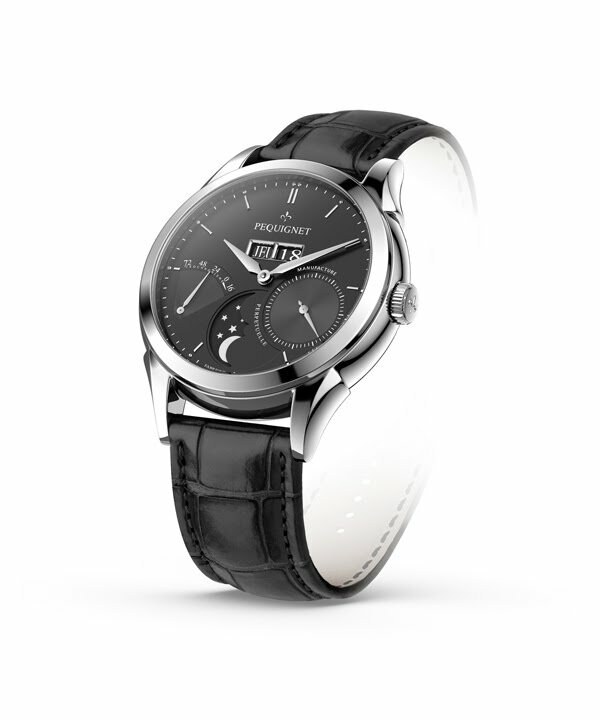 It was entirely designed and created in Pequignet’s Haute Horlogerie laboratories and workshops in Morteau, France. 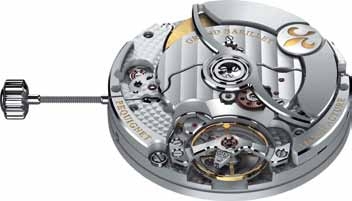 It is a completely innovative calibre, not merely a reorganisation of an existing base, which, in a world first, integrates all the haute horlogerie complications on a single main plate. It is the perfect marriage of complex Haute Horlogerie with elegance, symmetry and reliability. In 2011, the Rue Royale model received a wealth of awards, including “Watch of the Year” in the Netherlands, Belgium, and Japan. The renowned magazines Chronos and Watch File recognised it as the Best Watch in 2011, beating competition from the best-known Swiss watch manufactures. Never before in the history of luxury watchmaking has such a distinction been awarded to a French manufacture. 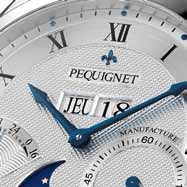 Pequignet Manufacture is truly the face of the renaissance of French Haute Horlogerie. and time display resulting in a distinguished, elegant timepiece. The Calibre Royal was entirely designed, prototyped, tested and assembled in Pequignet’s Haute Horlogerie laboratories in Morteau, France. Its creation required 279 technical drawings, 318 components, of which 316 were created to plan by the Pequignet laboratory, 150 tools and component manufacturing matrices, and more than 20,000 dimensions,… Benefiting from 9 international patents, the Pequignet Manufacture Calibre Royal is a true masterpiece of innovation! Mechanism service life, oil durability, adhesion of lubricants. “100-hour design” large barrel, set to 88 hours. Initial force distribution by a large central barrel axis, independent of the large barrel, and inserted between 2 jewels. Linearity and stability of initial force. Exceptional isochronism range guaranteed for 72 hours, with dial display. Amplitude set to 220° in vertical position after 72-hour operation. High inertia large balance with compensating screws and stud holder clamp to safeguard operation against impacts. The crossover bridge ensures robustness, stability and positioning precision, as well as impact resistance. Also available in Breguet hairspring version. 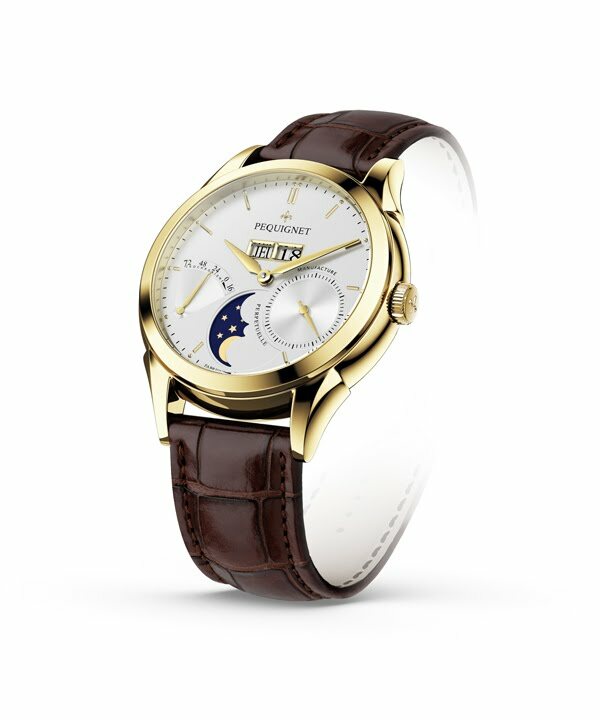 All complications - large date and day, power reserve indicator, moon phase and future complications - are and will be integrated into the initial main plate. 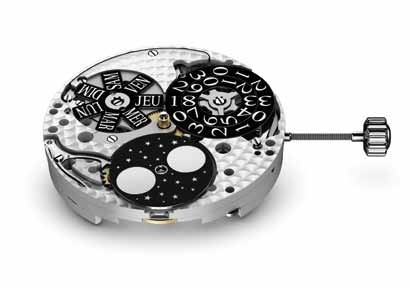 This integration ensures stability, reliability and harmony in a multiple complication calibre. Multiple complications built into a 133/4 calibre with a height of just 5.88 mm, making for a highly elegant multiple complication watch. High degree of open working over the entire regulating part, large balance, pallet fork and pallet wheel. Observable winding system and power reserve differential. 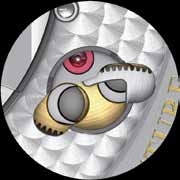 Large barrel, oscillating weight and large balance aligned on central axis of movement. 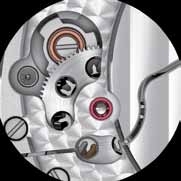 The escapement, barrel and automatic system enable independent and separate After-Sales servicing on each of the 3 parts. Large mono-block tungsten carbide weight, offset for balance visibility, circulating on a peripheral runner. A large 4-arm diamond-polished balance, with high inertia, ensures accuracy and regularity. This large balance also provides resistance to impacts, interference, and single or simultaneous activation of one or more complications. Central protection viaIncabloc damper system. The laboratory opted for a highly specialised frequency of 21,600 vibrations/ hour (3 Hz) to ensure regulating part reliability and service life. These technical reliability characteristics make for longer intervals between After-Sales overhauls and servicing. Balance crossover bridge providing positioning stability and impact resistance. Also available in Breguet hairspring version. Initial force distribution by a central barrel axis. Large balance with compensating screws. 220°amplitude in vertical position after 72-hour operation. Large date and day with no amplitude loss upon activation. Unique system for exceptional reliability and accuracy. 100-hour power reserve design, set to 88 hours, dial display with 72-hour guaranteed isochronism. Oscillating weight with sunray finish and rhodium plating, gilt Lys logo. Case-back secured by 6 screws with polished heads. Non-reflecting sapphire crystal and case-back. Chapter ring and small seconds with fine circular satin finish, black transferred Roman numerals, dotted thread. 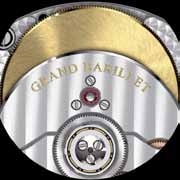 Power reserve in circular satin-finished cartouche. Large-scaled alligator strap, beaded, ardillon buckle with relief Lys logo.